How To: Knowing When It's Done The thermometer is your friend. The thermometer is your friend. Insert in the chicken or turkey after cooking for a quick read. If the chicken or turkey needs more time, remove the thermometer and continue cooking. Stays in the chicken or turkey throughout the cooking process. Gauge the temperature on the dial. 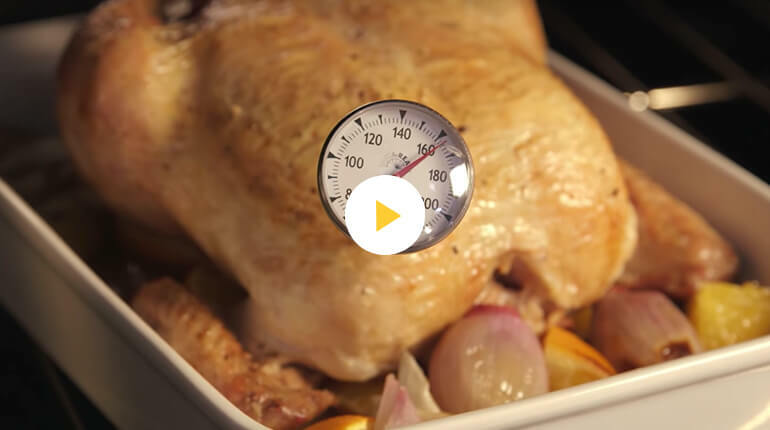 Use your meat thermometer to ensure doneness and safely cook poultry to its optimum quality. Place thermometer in the thickest part of the cut, without touching bone. Make sure juices run clear. Ensure doneness with a meat thermometer. Refrigerate any leftover chicken or turkey immediately and use within 3-5 days.